Walter Demolder; guitar; studied with Paolo Radoni with «Les Lundis d’Hortense» in the 80’s after which he moved to Ireland where he studied with Louis Stewart. After 30 years he returned to Belgium to start a new band the «Jazztronomics» and then «Con Alma». Jo Van Waterschoot ; Bass : played for years in the coverband Soapband and studied jazz in the Jazzstudio in Antwerp. His performances can be seen everywheree in Belgium and beyond. Bernard Biltris; Piano; Got his formation in THe Jazzstudio in Antwerp and played in the bg band » Swing and Soul» for several years afte which he joined Con Alma. 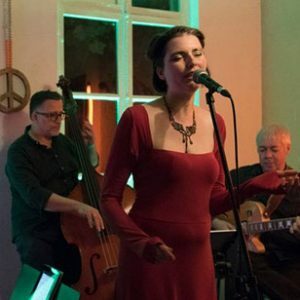 Con Alma has been gigging on a regular base since 2013 and was joined by a lovely singer in 2014 to complement the band. Marie Schoovaerts: vocals : studied vocals with Sofie and Tutu Puoane in Antwerp and Ghent focussing on jazz. Gained experience in big bands , funk bands and quartets.